Oscar Sesame invites you to cross dreams through enchanting nights. A quality and an extraordinary touch with the percale 100% cotton and its 220 threads. Why not have fun choosing different coloured pillow cases! It’s your turn! Made with dreams in Portugal! > Test the patterns & the colors with the Samples Set! Swann Sesame joins our range of plain bed linen & invites you to cross dreams through enchanting nights.100% cotton with its golden embroidered dot, we love its slightly crumpled side! Flap fastening. The off-white color overlock brings a modern touch. Made with dreams in Portugal!> Test the patterns & the colors with the Samples Set! Slip into our new Sesame duvet cover. 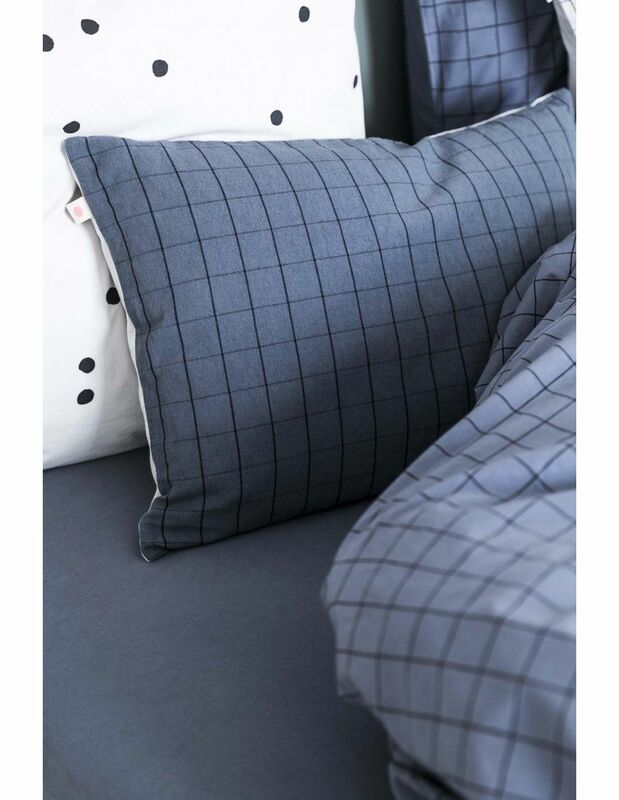 100% cotton, it is very sweet!We love its slightly crumpled side and especially not having to iron!Its grey color entwined with an elegant edging floods your bedroom with warmth.Single duvet : 140 x 200Double duvet : 220 x 240 & 240 x 260 cm Made in Portugal> Test the patterns & the colors with the Samples Set! Our new Sugar fitted sheet and its off-white is ready to slip under your sheets.100% super-soft cotton percale! 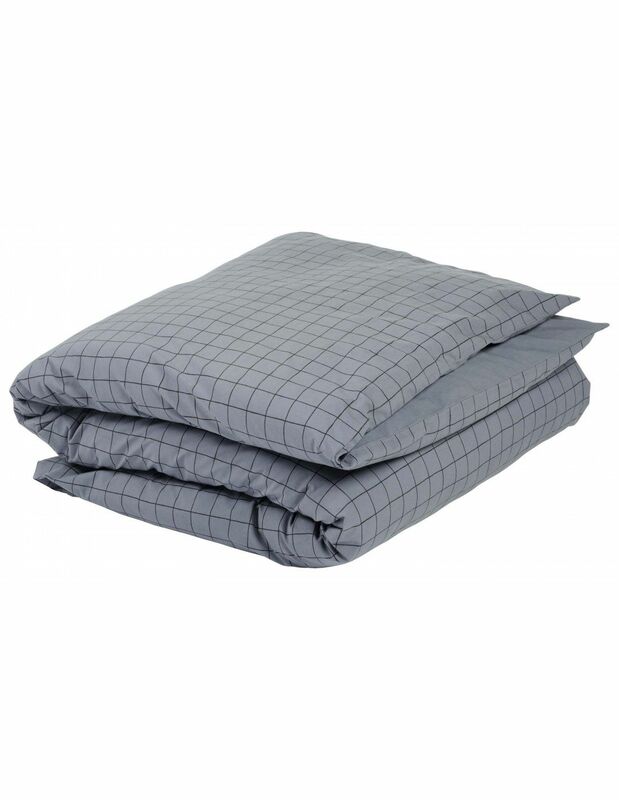 Single fitted sheet : 90 x 200 cmDouble fitted sheet : 140 x 200 & 160 x 200 cm (Queen Size) Our sheets have a height (a corner) of 30 cm. Made in Portugal> Test the fabric, the patterns & the colors with the Samples Set! Make way for our iconic Finette stripe!On our pillowcases, this little indigo and white stripe will refresh your long summer nights!100% cotton percale, we love its slightly crumpled side and especially do not have to iron! Backside 100% off-white plain cotton.Made in Portugal> Test the patterns & the colors with the Samples Set! Sugar, our new sweet and gourmet color joins our range of plain bed linen. 100% cotton with its golden embroidered dot, we love its slightly crumpled side!Flap fastening. The off-white color and the ardoise overlock bring light and originality. Made in Portugal> Test the patterns & the colors with the Samples Set! Our new sweet and gourmet color Sugar joins our range of plain bed linen.100% cotton with its golden embroidered dot, we love its slightly crumpled side! Flap fastening. The off-white color and the fluo overlock bring light and originality.Made in Portugal> Test the patterns & the colors with the Samples Set! Our duvet cover Finette and its iconic small indigo and white stripe will refresh your long summer nights! 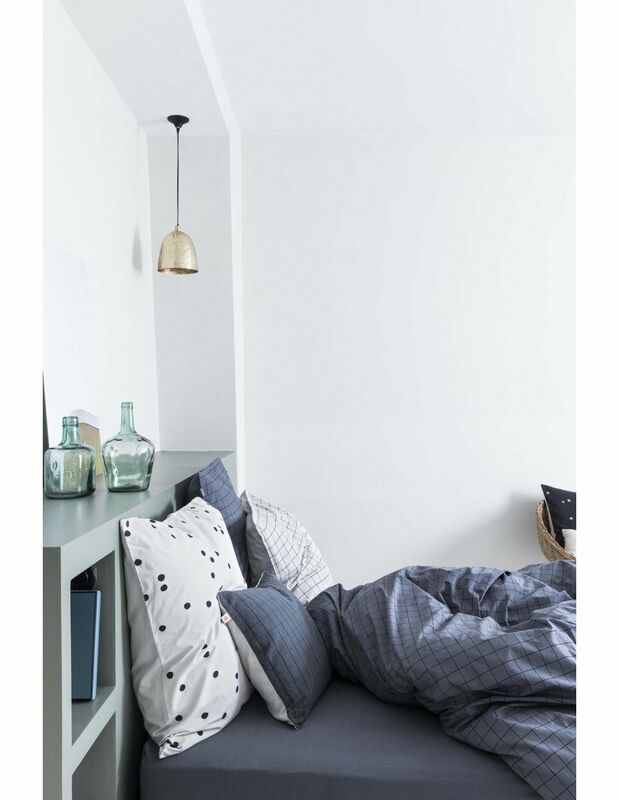 100% cotton percale ; Backside 100% off-white plain cotton.Single duvet : 140 x 200 cmDouble duvet : 220 x 240 & 240 x 260 cm Made in Portugal with Finette!> Test the patterns & the colors with the Samples Set! Slip into our new Sugar duvet cover.100% cotton, it is very sweet! We love its slightly crumpled side and especially not having to iron! Its off-white color entwined with an elegant edging floods your bedroom with light.Single duvet : 140 x 200 cmDouble duvet : 220 x 240 & 240 x 260 cm Made in Portugal> Test the patterns & the colors with the Samples Set! Slip into our new Sugar duvet cover.100% cotton, it is very sweet! We love its slightly crumpled side and especially not having to iron!Its off-white color entwined with an elegant edging floods your bedroom with light.Single duvet : 140 x 200 cmDouble duvet : 220 x 240 & 240 x 260 cm Made in Portugal> Test the patterns & the colors with the Samples Set! Sink into the deep Peacock color and a little golden dot embroidery with the overlock finition in Craie color.Why not have fun choosing different coloured pillow cases to your duvet cover?100% super-soft cotton percale! Flap fastening. Made in Portugal> Test the patterns & the colors with the Samples Set! Sink into the sweet Iode color and a little golden dot embroidery with the overlock finition in Sencha color.Why not have fun choosing different coloured pillow cases to your duvet cover?100% super-soft cotton percale! Flap fastening. Made in Portugal> Test the patterns & the colors with the Samples Set! Sink into the greedy Biscuit color and a little golden dot embroidery with the overlock finition in Dijon color.Why not have fun choosing different coloured pillow cases to your duvet cover?100% super-soft cotton percale! Flap fastening. Made in Portugal> Test the patterns & the colors with the Samples Set! Slip under our plain fabric duvet cover in the deep Peacock color.Why not have fun choosing different coloured pillow cases, like Craie, Dijon or Iode? It’s your turn! 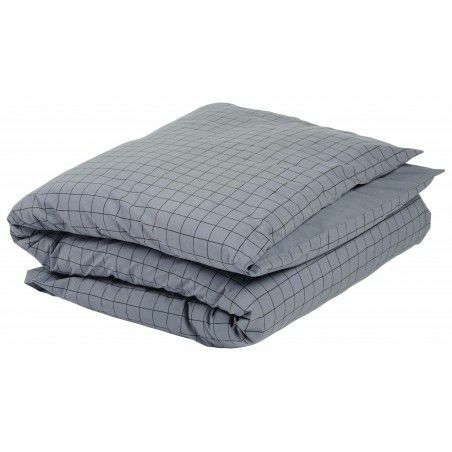 100% super-soft percale cotton! Button fastening.Single duvet : 140 x 200 Double duvet : 220 x 240 & 240 x 260 cm Made in Portugal> Test the patterns & the colors with the Samples Set! Slip under our plain fabric duvet cover in fresh Iode color. Why not have fun choosing different coloured pillow cases? It’s your turn! 100% super-soft percale cotton! Button fastening.Single duvet : 140 x 200 Double duvet : 220 x 240 & 240 x 260 cm Made in Portugal> Test the patterns & the colors with the Samples Set! Sink into a shower of soft dots and the deep Peacock colour. Why not have fun choosing different coloured pillow cases to your duvet cover? It's your turn!100% super-soft cotton percale! Flap fastening.Made in Portugal> Test the patterns & the colors with the Samples Set! Sink into a shower of soft dots and the strong Slate colour. Why not have fun choosing different coloured pillow cases to your duvet cover?100% super-soft cotton percale! Flap fastening.Made in Portugal> Test the patterns & the colors with the Samples Set! Sink into a shower of soft dots and the sweet pink Biscuit colour. The Biscuit mixes perfectly with the Dijon and Ardoise colours: why not have fun choosing different coloured pillow cases to your duvet cover!100% super-soft cotton percale! Flap fastening.Made in Portugal> Test the patterns & the colors with the Samples Set! Sink into a shower of soft dots and the sweet Iode colour. The Iode mixes perfectly with the Dijon and Ardoise colours: why not have fun choosing different coloured pillow cases to your duvet cover?100% super-soft cotton percale! Flap fastening.Made in Portugal> Test the patterns & the colors with the Samples Set! Sink into a shower of soft Odette dots. The Dijon mixes perfectly with the Biscuit and Ardoise colours: why not have fun choosing different coloured pillow cases to your duvet cover?100% super-soft cotton percale! Flap fastening.Made in Portugal> Test the patterns & the colors with the Samples Set! Sink into a shower of soft Odette dots. The sweet Craie color mixes perfectly with all colours of the range: why not have fun choosing different coloured pillow cases to your duvet cover?100% super-soft cotton percale! Flap fastening.Made in Portugal> Test the patterns & the colors with the Samples Set! Slip under a shower of Odette dots. The Dijon mixes perfectly with the Iode and Ardoise colours: why not have fun choosing different coloured pillow cases? It’s your turn! 100% super-soft cotton percale! Button fastening.Made in Portugal> Test the patterns & the colors with the Samples Set!